Ultra VNC is the remote desktop support client used by ITS for Windows Vista workstations. These instructions can only be done by ITS Staff and will only be installed on Luther owned workstations. Download Ultra VNC from its-software. Accept the License Agreement and click Next three times. 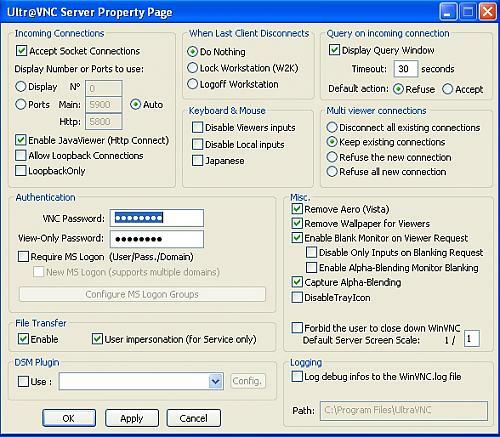 Under Select Components, choose Ultra VNC Server Only and click Next twice. Under Optional non-GPL Addons, check Download Vista Addons Files Now and click Next. Under Optional Non-GPL Mirrow Driver, check Download the Mirror Driver and click Next. Under Select Additional Tasks, check Register UltraVNC Server As a System Service and Start or Restart UltraVNC Service. Right Click on the Windows Task Bar and select Properties. Under Notification Area, select Customize. Locate Ultra VNC (or WinVNC). In the Behavior drop-down, change to Always Show (Show in Windows Vista).